If you live in St Charles, MO, or in Boonville, MO, you've probably heard some variation of Boone's Lick. In Boonville, you have the Boonslick Bridge. In St Charles, you know Boone's Lick Road. 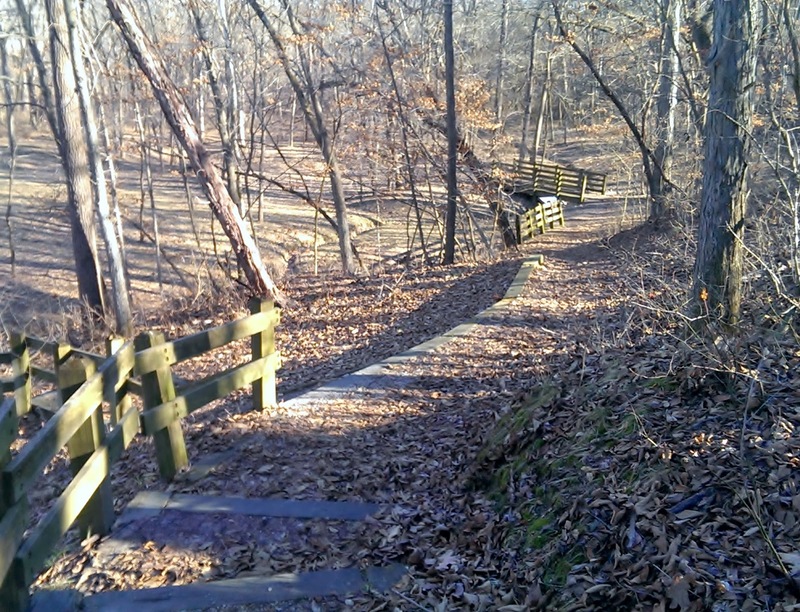 But did you know that the Boone's Lick Trail connects St Charles and Boonville? 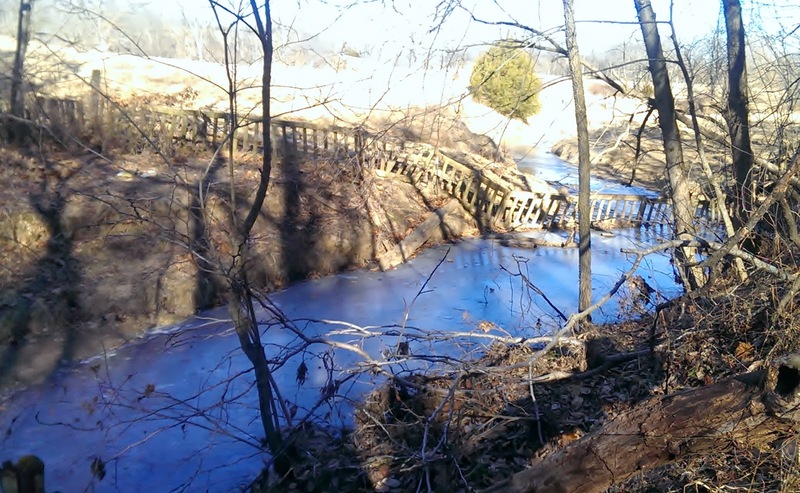 The Boone's Lick Trail was created when the sons of Daniel Boone (you remember him from Boonesfield Village), Daniel Morgan Boone and Nathan Boone, set out to start a salt mining operation in Howard County with James and Jesse Morrison. This came to be known as Boone's Lick, even though the Boones sold out to the Morrisons after 5-7 years. 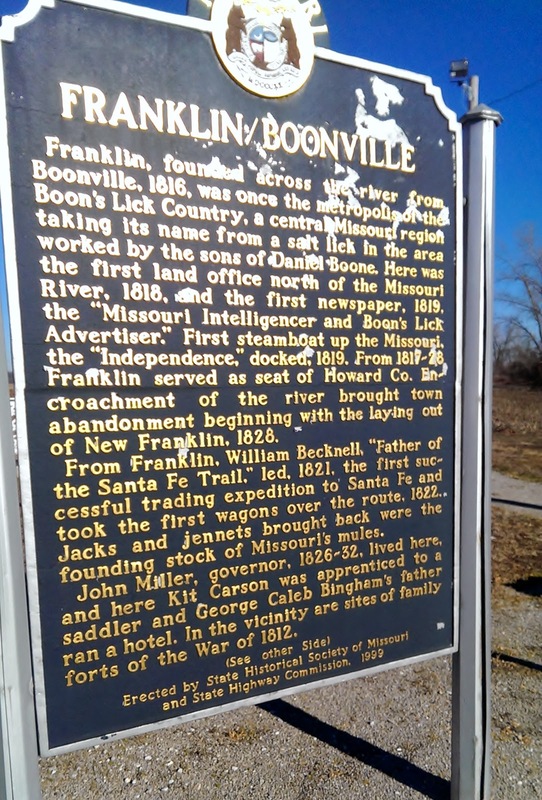 The Boone's Lick Trail followed the Missouri River from St Charles to Franklin, where it connected with the Santa Fe Trail. 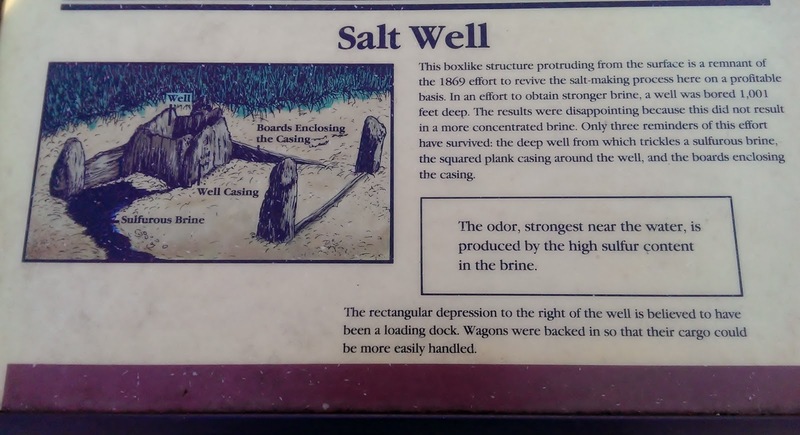 This method of salt mining takes brine (saltwater) from the springs and boils it down in salt kettles over furnaces that were either built above ground, or over a pit. 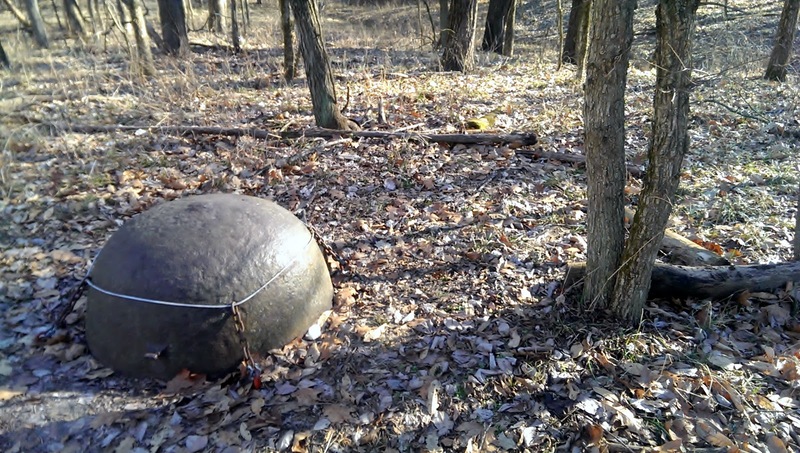 The ball below is one of those salt kettles, and the grave you see at the top of this entry is that of James Morrison's son, who fell into a salt kettle and was horribly burned, and died of his injuries. On our first road trip of 2014, we went high tech, with Field Trip and Pocket Ranger running at the same time. Turns out the Pocket Ranger Passport Challenge that I thought was only running for a month is actually running for something like a year and a month, so you have about six months to catch up. Here's one thing I learned on this excursion: YOU HAVE TO CACHE YOUR MAPS. This was the first time we were in an area with no cell phone signal whatsoever, and of course we did not cache the maps first. This site is well off the highway, and as you can see, not really something you would go back to after caching your maps just to get the check in. If it's worth 10 points, you should DEFINITELY cache before leaving cell phone reception behind. Also, you should really tell someone where you are going before you go to a remote area with no cell phone reception. 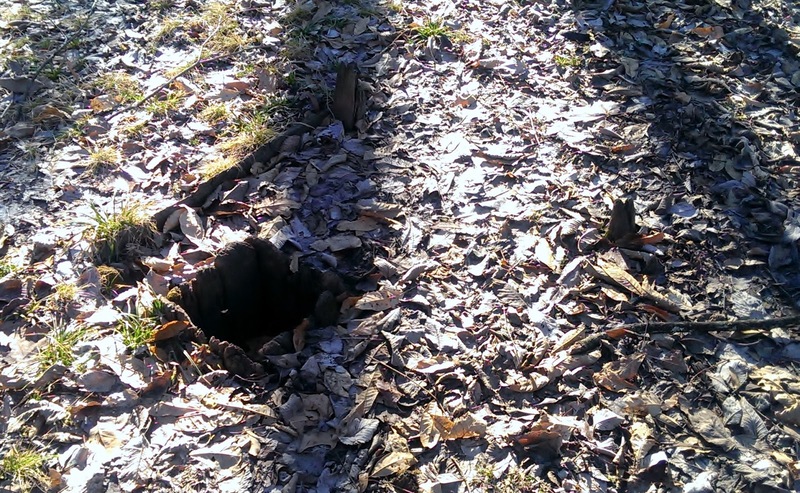 I can assure you that if you disappear, the Boone's Lick State Historic Site is probably the last place anyone would think to look for you. Francis here with another military postings for all you CCG fans. Beth and I recently went to Ft. Leonard Wood, Missouri, which is home of the United States Army Chemical Corps, Engineers and Military Police. 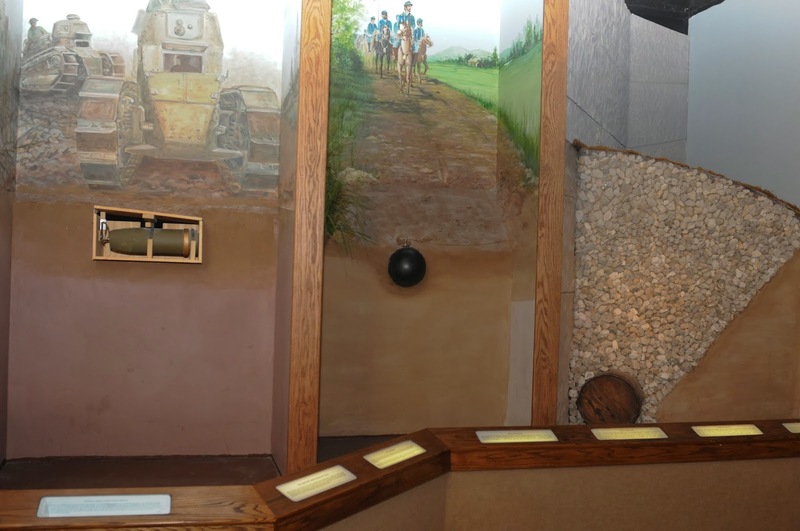 Recently, museums have been built to honor and show the histories of these three storied branches of the Army. The Army Corps of Engineers. 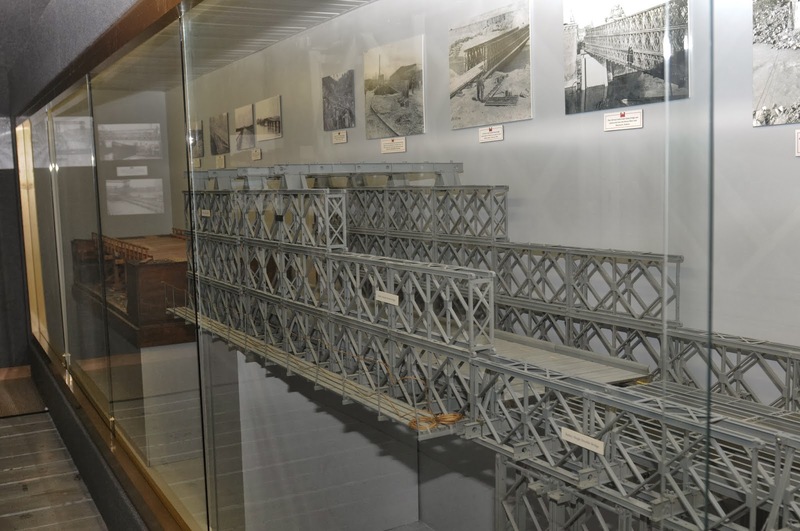 Today, Army engineering isn't just building bridges or blowing them up. Engineers work on everything from environmental restoration and stewardship to providing a quarter of the country's hydroelectric power. When deployed overseas, the members of the CoE help build and maintain infrastructure and provide all kinds of support for war fighting Soldiers. Divers, welders, firefighters and all manner of other jobs are included in the CoE. 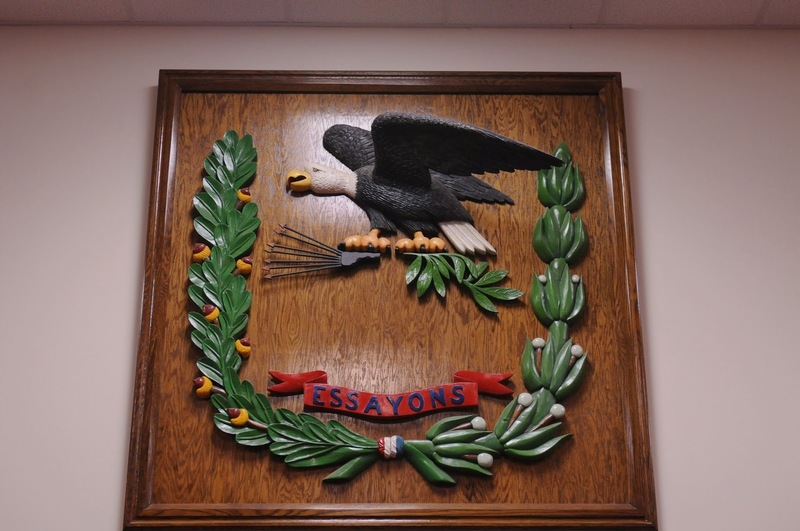 Essayons is French for "Let us Try", the motto of the Corps of Engineers. It is the attitude of every engineer when faced with a problem: Let me take care of it. Ft. Leonard Wood, Mo. has the training base for the majority of Army engineers, and the museum they have built to honor the engineering soldiers is remarkable. This is the first scene that greets you upon entering the museum. In the early years of the Iraq war, Soldiers noticed there were bombs strapped to a bridge they were attempting to cross. 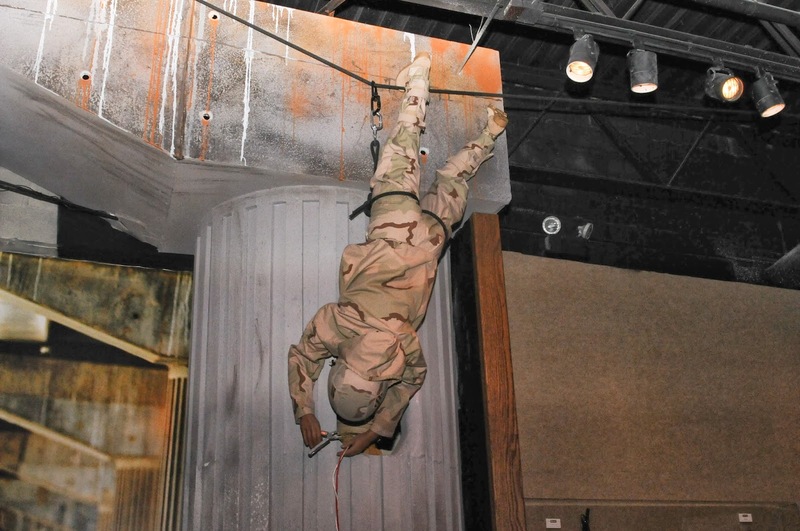 They rigged a line and actually had one Soldier dangling upside down to cut the wires. Some engineers are classified as working dog handlers. 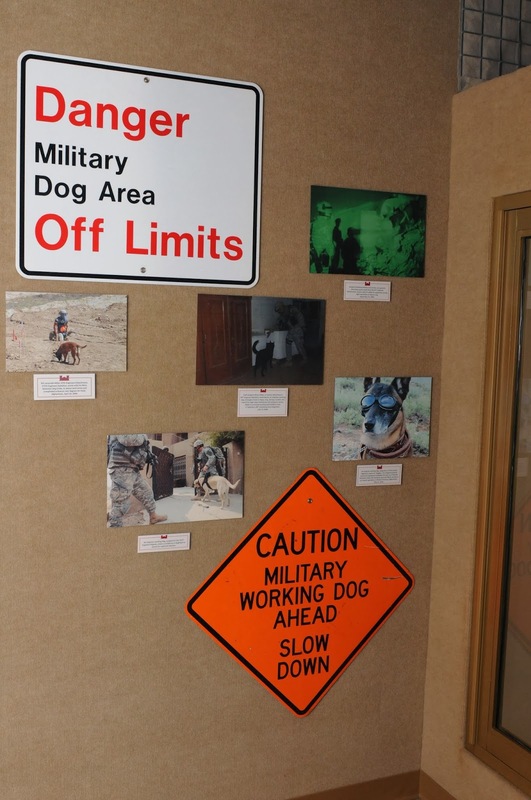 While usually used by military police, some engineers are trained to use dogs as well. For the CoE, they are primarily used as bomb/unexploded ordinance sniffing dogs or rescue dogs trained to find survivors. Like the Chemical Corps. 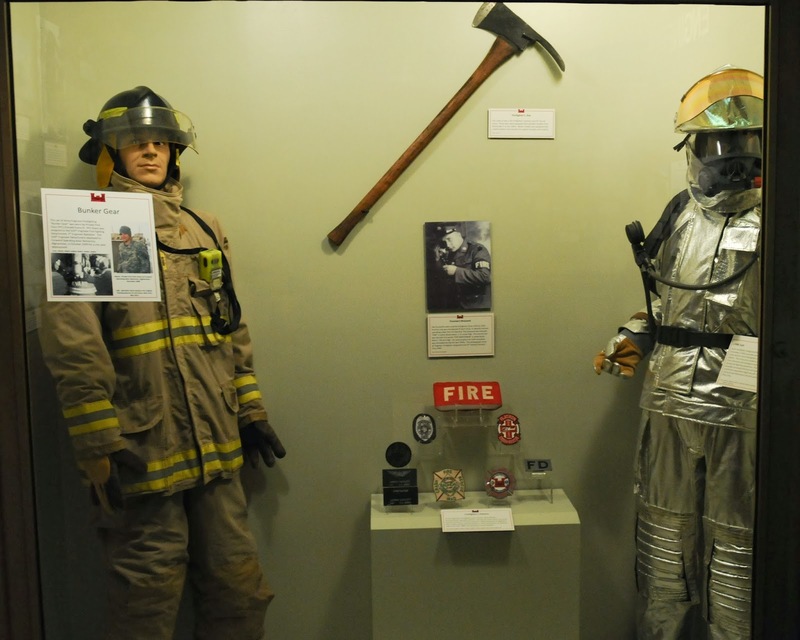 museum, the engineers also have high quality wax figures in all their displays. 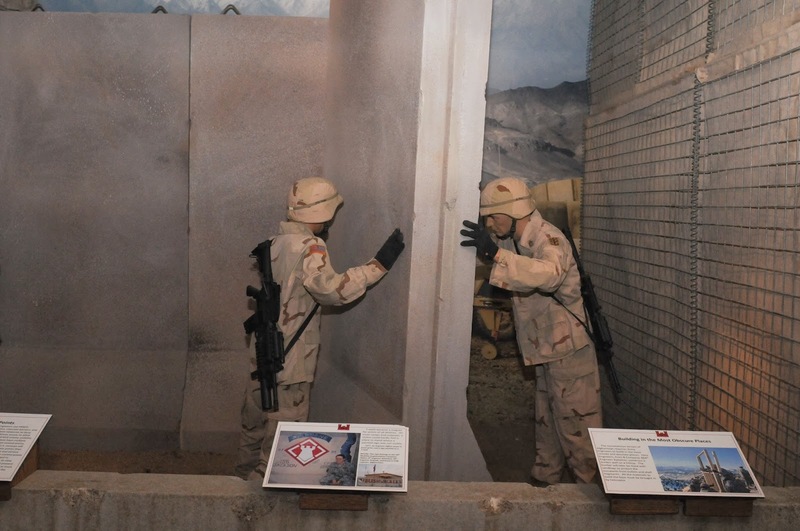 Here, Soldiers are placing Bremer Walls, better known as T-Walls due to their cross section shaping. The twelve foot tall, steel reenforced walls can be easily moved around with heavy equipment and interlocked to form a blast shield to protect from explosions and incoming fire. This cross section shows various improvised explosive devices and the different kinds of concealment and placements used by enemy forces. 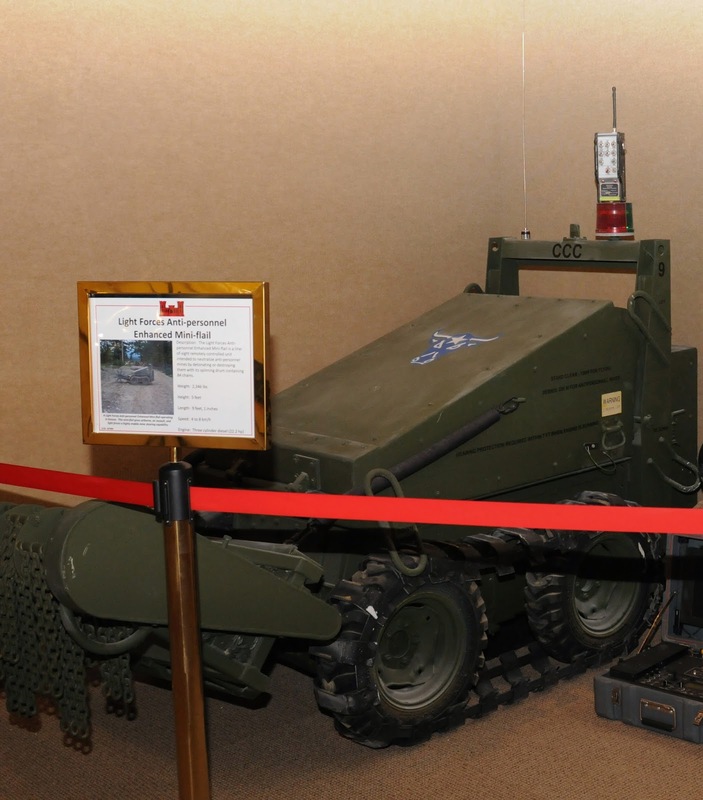 While unexploded ordinance disposal isn't one of the missions of the Army engineers, they have plenty of equipment to deal with mines and explosives. Mine flails like this work by beating the ground in front of the machine to trigger any mines in the ground. These vehicles were heavily armored to protect it and the operator from explosions. These days the engineers have upgraded their equipment to include radio controlled robots with manipulator arms. 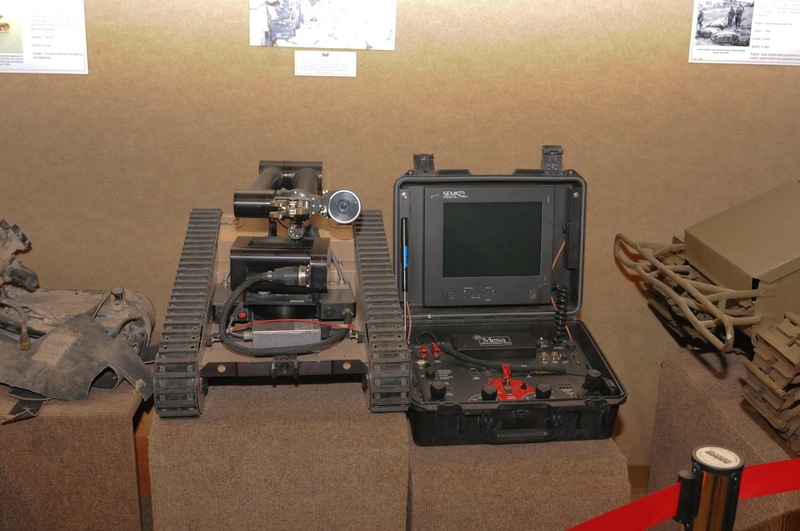 These robots can go into dangerous situations without putting the lives of Soldiers at risk. 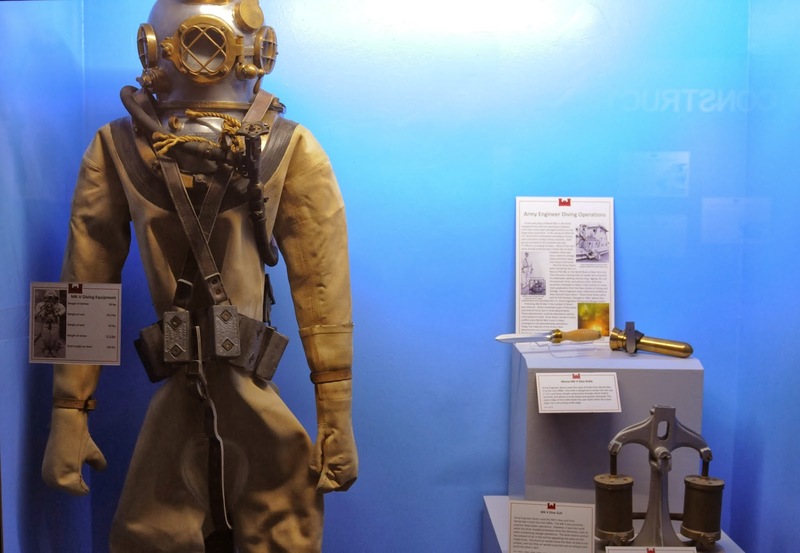 Army Engineer divers have modernized their equipment from these standards, but are still very actively used in underwater reconnaissance, demolitions and salvage. They also inspect bridges, tunnels and other underwater facilities. Structural examples of permanent and semi-permanent bridges which can be built by engineers. 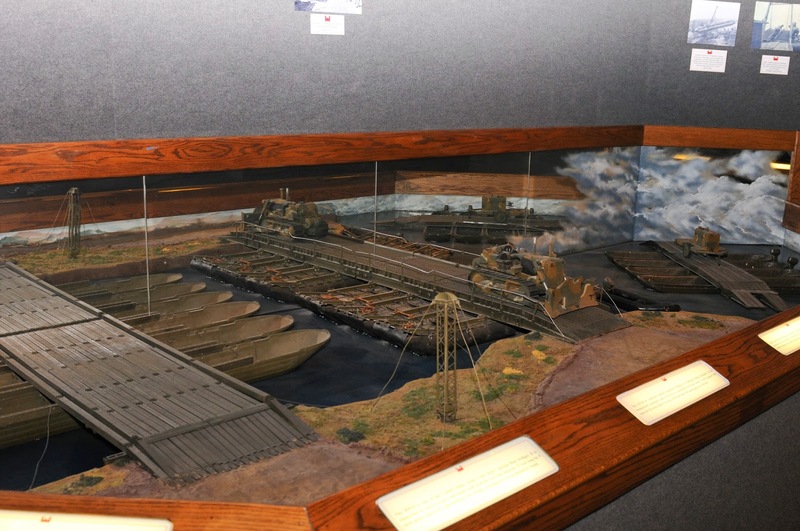 Next to this display was a section of trestle to give you an idea of the scale of it. I couldn't photograph it well enough to portray the massive scale of these spans. 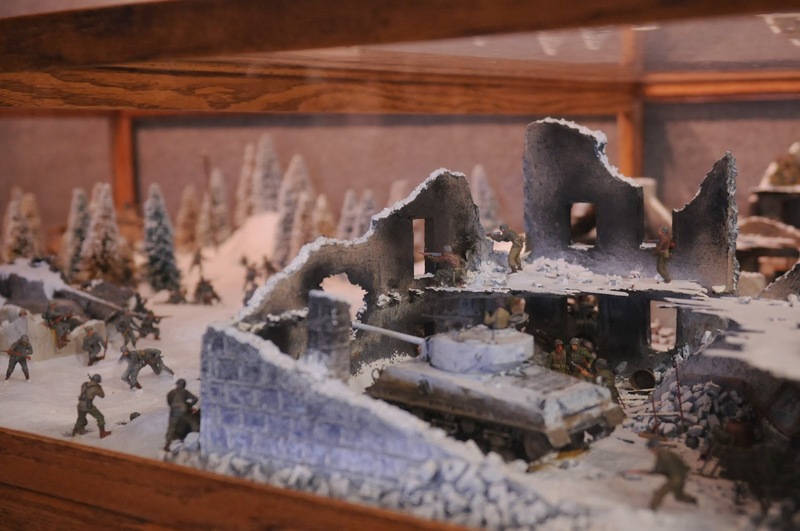 Example dioramas are all over the museum, giving a glimpse into the history and abilities of the Army engineers. The museums are open from 10 am to 4 pm Monday through Saturday. 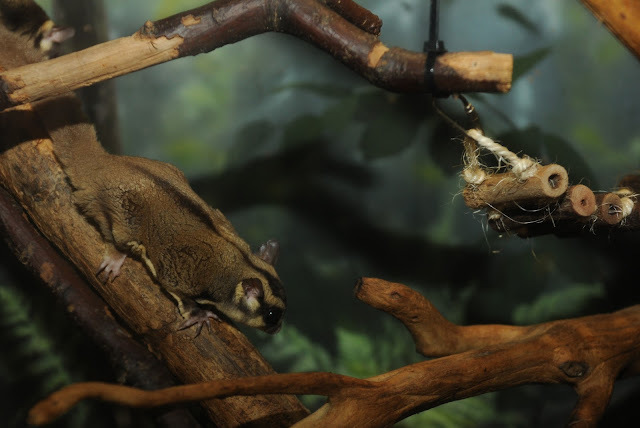 They are on the actual base of Ft. Leonard Wood, but free and open to the public. You'll need a valid photo ID to enter the base. We made a pit stop in Kingdom City on Saturday, which is an excellent place for a pit stop when you are crossing Missouri. It's the junction between Interstate 70 and Highway 54, home of Ozarkland and former home of the Nostalgiaville USA retail store (they still have an online store), as well as the Heart of Missouri Tourism Center. 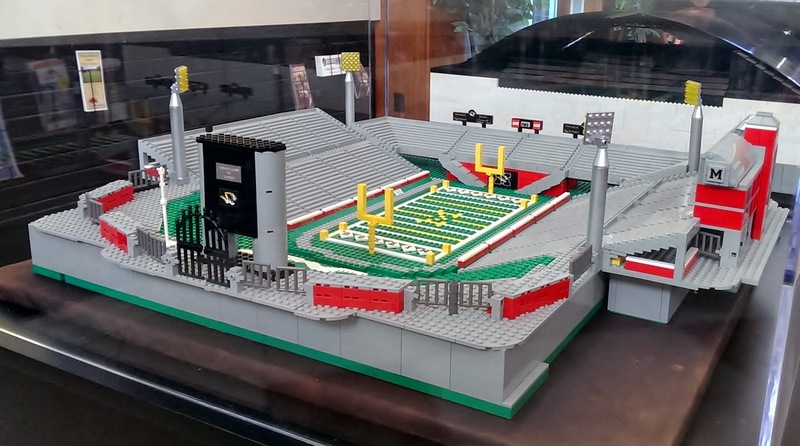 At the Tourism Center we discovered this LEGO Faurot Field, which is Mizzou's (Missouri University at Columbia) stadium. 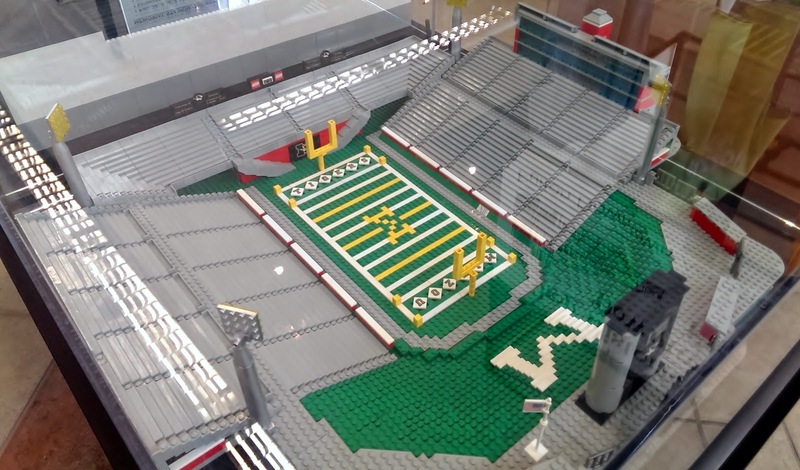 There's also a LEGO arena next to it, but it's very difficult to photograph with the dome on top. The Heart of Missouri Tourism Center is operated by the Calloway County Tourism Board and you'll find it at exit 148 off Interstate 70. 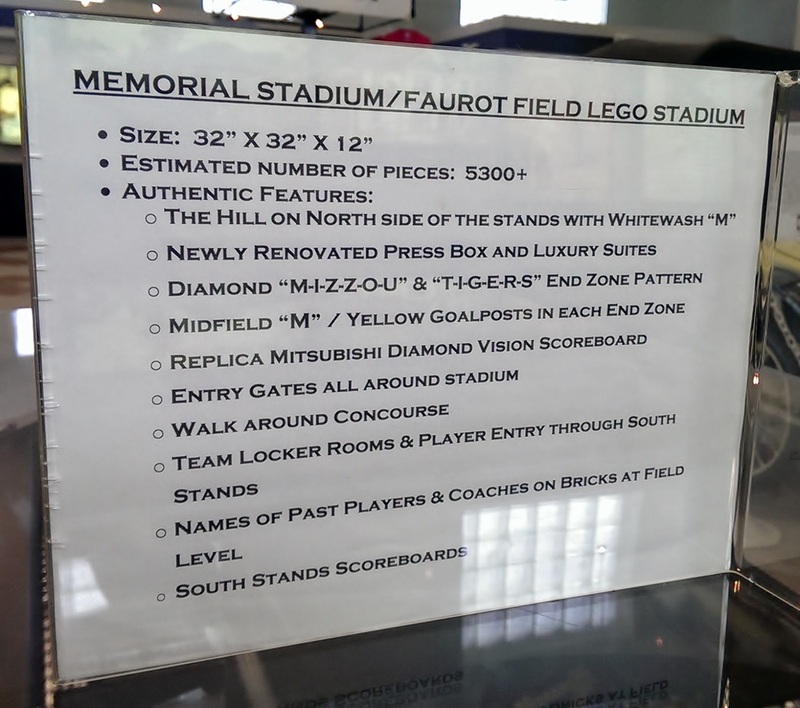 Stop in and check out the LEGO stadium, the antique Mobilette car, and the Missouri Firefighter's Memorial (more on this in a future blog)! Boonville, I love you. First of all, your downtown is charming and quaint and I hope to do some local shopping later in the year when it's warmer and we get to town before 6pm. Second, the Hotel Frederick is lovely and historic, and no matter what skinflint TripAdvisor reviewers say, it's worth every penny. Stay at the Super 8 if you don't care about nice towels and bedding. Third, Boonville Facebook fans, you really rallied when I put out the call for tips, and while we didn't get to much on this winter trip, we will be back for sure. Finally, wow, this little patch of dirt on Highway 87 near the Katy Trail. 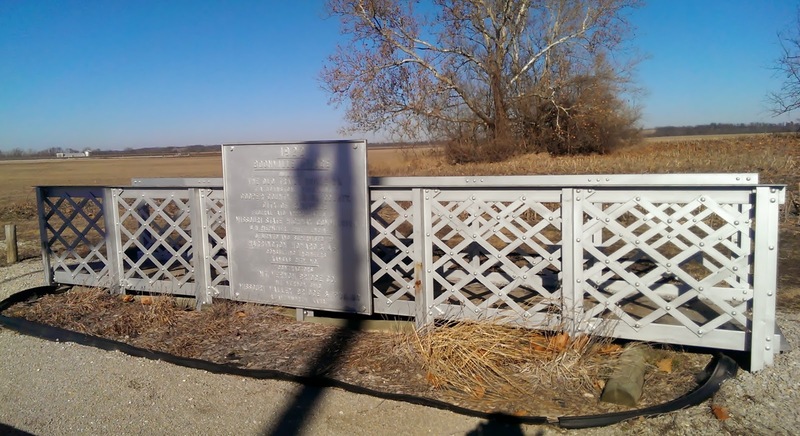 As you can see from just one side of the sign in the first photo, there is quite a lot of history and "firsts" crammed onto either side of the Missouri River right here. This is on the other side of the bridge from Boonville, which was "settled" when the widow Hannah Cole moved here with her nine children in 1810. 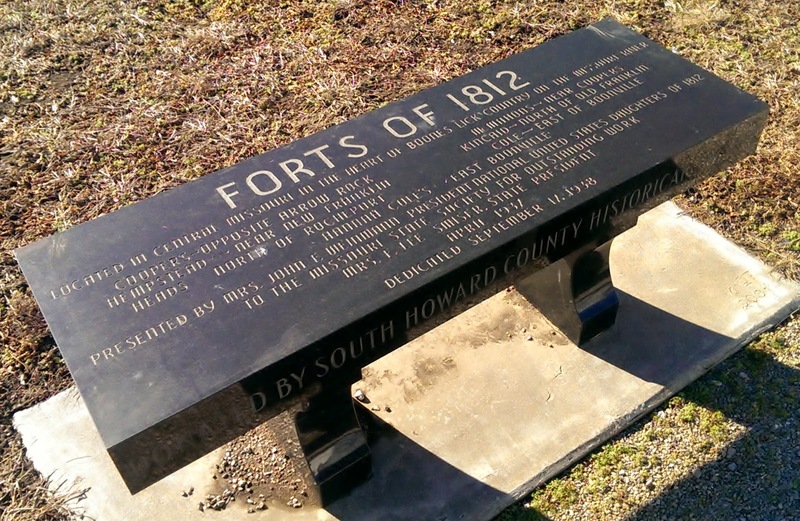 A neighborhood fort was built at her property for the War of 1812, and this and other neighborhood forts are commemorated on the bench above. 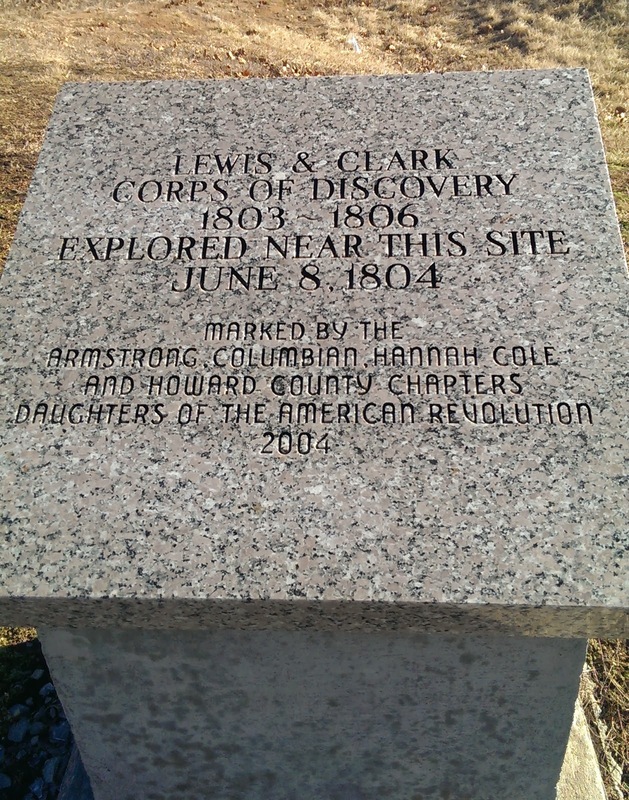 But before Hannah Cole, there was Lewis & Clark, who explored this site in 1804. Apropos of nothing, June 8th is my birthday. 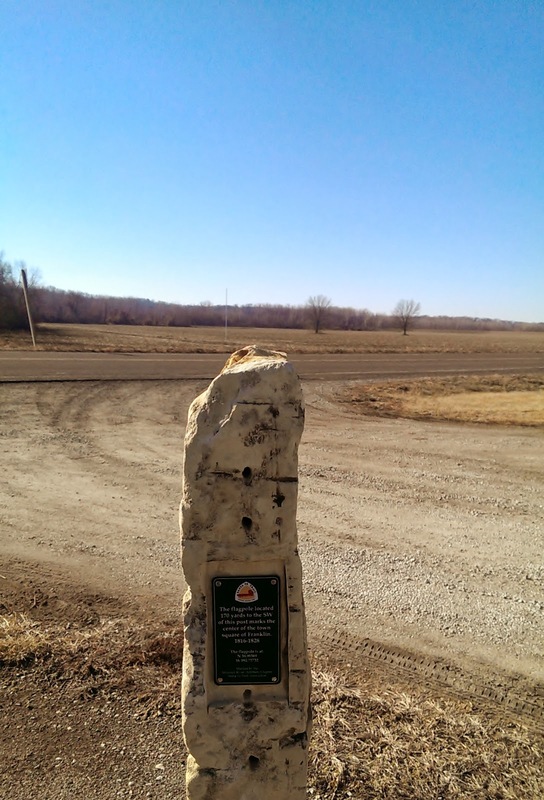 You'll find plenty of Lewis & Clark Trail signage in this area, since they were following the Missouri River. Franklin, on the other side of the river, was once where you are standing now, and if you face this post and look at the flagpole across the road, you'll see the site of the former town square. Unfortunately, the river forced the town to relocate (New Franklin, of course) in 1826. Old Franklin was the site of many firsts in the area, including the first land office and newspaper north of the Missouri river. 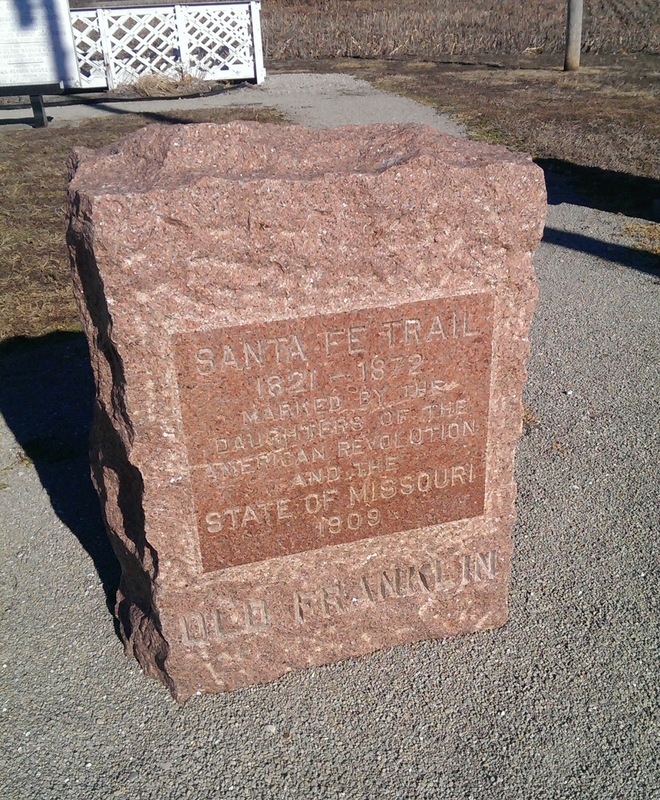 In 1821, the first trading expedition to Santa Fe left from Franklin, and thus the Santa Fe Trail began. And finally, we have this section of the historic Boonville Bridge. This is kind of like a shrunken version of the bridge, with pieces of the guardrails and the nameplate for you to gaze upon. It was replaced by the Boonslick Bridge (which will take you back to Boonville from this site) in 1995. You can see what the old bridge looked like here. Wondering about all the Boon(e)s around here? You may remember my post a few years ago about the Daniel Boone Home and Boonesfield Village. Over here on the other side of Missouri is where Daniel Boone's sons started a salt business, and the route from the Daniel Boone home to the Boone's salt operation near Boonville, MO is called the Boone's Lick Trail. We'll talk about that more in a future entry! I've been sitting on this for what seems like forever, and today I can finally tell you that Craves, Caves & Graves is now a content provider for the Field Trip app for iPhone and Android! Field Trip is an awesome way to find out about interesting things near you RIGHT NOW! With information on local architecture, oddities, history, food, concerts, and more, so there is no excuse for boredom ever again. Adventure is out there! Go on a Field Trip today! It's the middle of January and unseasonably warm this week, but I could still use some color in my life. I stopped here back in the fall to take some pictures so that I could tell my father in law that yes, I am positive, there is a Revolutionary War soldier buried at Sappington Cemetery. There are a few, in fact, in this tiny cemetery of 105 burials, including Sgt John Sappington, who was a personal bodyguard to George Washington. I was surprised to find that this cemetery, located in St Louis County, is older than most of the City cemeteries still in existence. Established in 1811, many of the burials are veterans of the Revolutionary War, War of 1812, Mexican-American War, and Civil War. There's not a lot to be found online about the history of Sappington Cemetery. I assume it was a family burial ground since there are so many Sappingtons, but I don't know if the rest are family or if it was open to other burials at some point. The City of Crestwood and Daughters of the American Revolution maintain the cemetery. 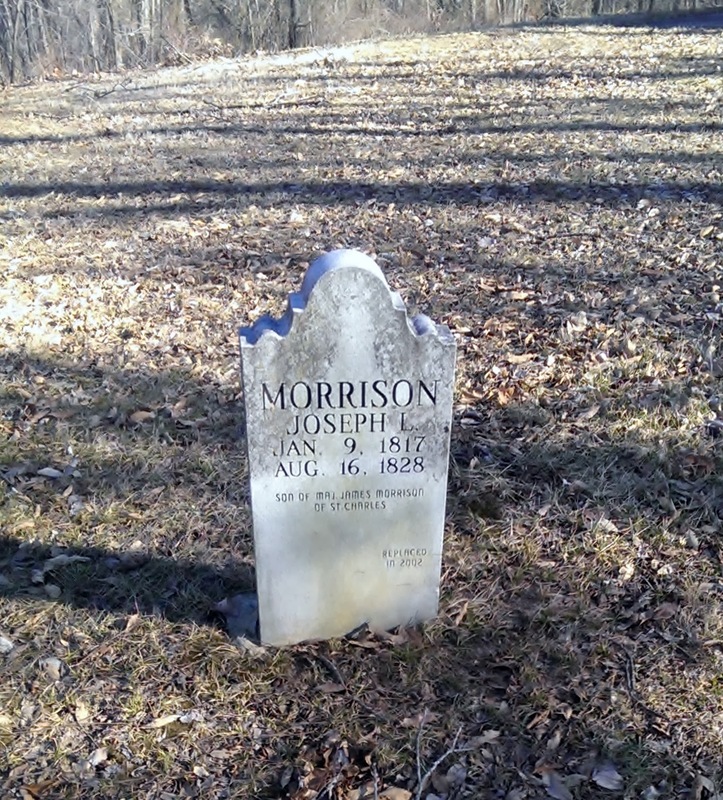 If you want to see more, you can find Sappington Cemetery On Watson Rd next to the office building at 9111 Watson Rd. If anyone has any historical background on this cemetery, I would love to hear it!